A large percentage of dogs, cats, and probably most other animals suffer, at least to some degree, from seasonal allergies- just like humans. Airborne pollens and molds are probably the most common culprits, but the list of possibilities is practically endless. 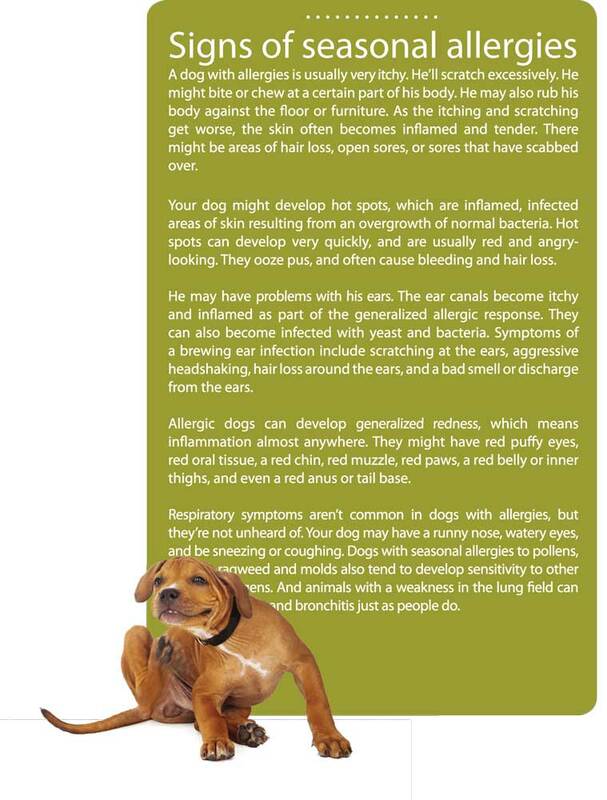 Finding and removing the exact allergens that cause your pet's misery can be virtually impossible. It doesn't matter where you live either – with spring comes a plethora of potentially allergenic particles— particles that are everywhere— in the wind, and in the water dish. So what to do? A trip to the veterinarian may yield a prescription for an antihistamine or, if symptoms are severe, a corticosteroid drug. Although either one can be effective toward shutting off the symptoms of seasonal allergy, neither will help correct the underlying immune system dysfunction that causes the problem. And in the case of corticosteroid drugs (such as Prednisone) the side effects of extended use can be far worse than the allergy itself. First and foremost, clean up the diet. If your purchasing choices are driven more by cost than by quality, chances are you are compounding the problem by throwing poor quality food ingredients into the mix. You may even be feeding ingredients that are causing your pet's allergy. Regardless, poor quality meat and grain bybroducts, artificial flavorings and preservatives and things like soy protein may be compromising the natural immunity of your pet. So make changes. Buy good food– recipes that feature whole meats (“chicken”, beef”, “duck”, etc.) and real vegetables as top line ingredients- not meat byproducts or cheap grain fillers. Second but equally important: start supplementing your companion's diet with fish and vegetable oils that are rich in Omega 3 fatty acids right now. Omega 3 fatty acids are essential components in the animal body's regulation of inflammatory response to any allergen that enters the body system. Without enough Omega 3 fatty acids in the diet, the body's inflammatory response to an invading allergen cannot be properly regulated, making the whole problem much worse than it should be. In my opinion, the best essential fatty acid supplements use fish oil as the primary ingredient- and the best fish oil is that which comes from the whole bodies of wild harvested cold water fish. Avoid products that are made from farm raised salmon or other cultivated sources, as they might contain potentially carcinogenic contaminants, like PCBs, or residual amounts of antibiotics and growth hormones that are used to farm the fish. Finally, to help alleviate some of the symptoms, you might want to try adding a few herbs to your pet's daily regimen. The following herbs are safe for dogs, cats, and most other mammals, and are all part of my favorite “Spring Tonic” tincture formula for hay fever. At the top of my list of anti-allergy success stories is nettle leaf. Many people and their animals find symptomatic relief from daily use of this herb, especially when its use is commenced at the earliest onset of hay fever season. One of the predominant theories of how nettle works is centered on the release of histamine. Histamine is a protein produced by the body that contributes to the body's inflammatory responses. If histamine is released by the body too quickly or in too much abundance, symptoms such as swelling, sneezing and coughing are more likely to occur. Nettle's chemistry includes an interesting assortment of proteins and histamine-like compounds that herbalists (like myself) believe may slow the body's own release of histamine, thus lessening severity of allergy symptoms. Herbalists have used eyebright herb for centuries to help relieve inflammation of upper respiratory mucus tissues. Eyebright is also thought to help support and strengthen various liver functions, meaning that it helps with the body's elimination of systemic waste that may otherwise compound the allergy scenario. Burdock has been used since ancient times as a safe, gentle liver tonic. In both Western and Traditional Chinese Medicine (where it is known as “gobo”) burdock has been long regarded as a specific remedy for various forms of chronic dermatitis. It is thought to work by supporting the liver in the elimination of protein byproducts and other metabolic waste that may otherwise cause allergic reactions if left in the body. The idea: get the allergenic stuff out of the body before inflammation is triggered. I regard licorice root as perhaps the most broad-spectrum anti-inflammatory herb available. In addition to strong liver-support attributes, this herb contains an assortment of phytosterol constituents that may serve to supplement the body's natural production of cortisone; a hormone that serves to further slow and regulate the body's inflammatory response. It is also anti-tussive and expectorant, meaning that it will help make your pet's coughs and sneezes less violent and more productive. http://AllPetNaturals.com Offers Organic Medicines And Natural Pet Products That Are Safe For Your Pets. If You Want The Very Best For Your Pets, Our Holistic Medicine And Bully Sticks For Dogs Is The Perfect Pet Alternative.